Today we follow the band’s vocalist – Suu! 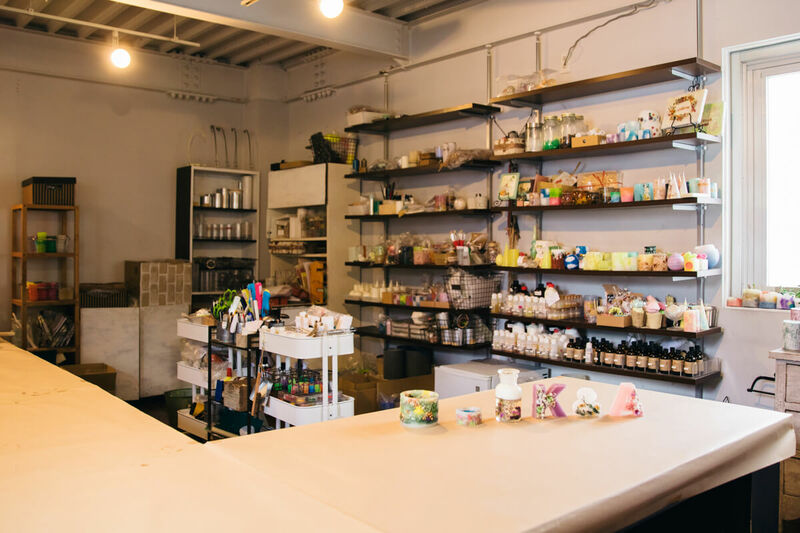 Suu is a huge candle lover and says that she has a lot of candles in her home. 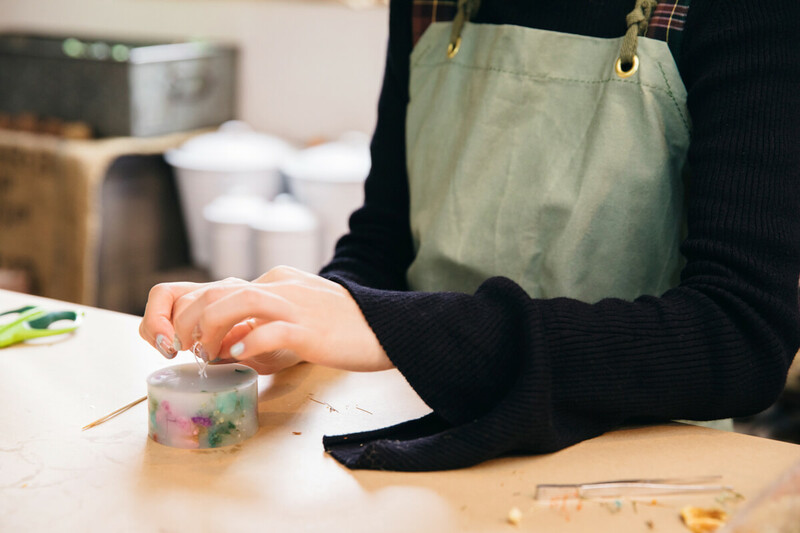 She’s always wanted to try candle-making, so she’s taken this opportunity to challenge herself to the task! 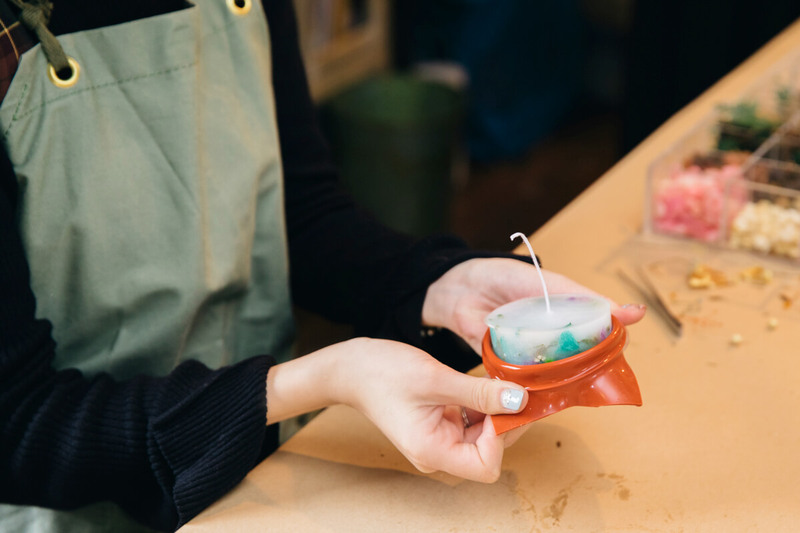 Suu visited Candle Studio in Daikanyama and participated in a one-time candle-making lesson. You get to make one complete candle to take home. 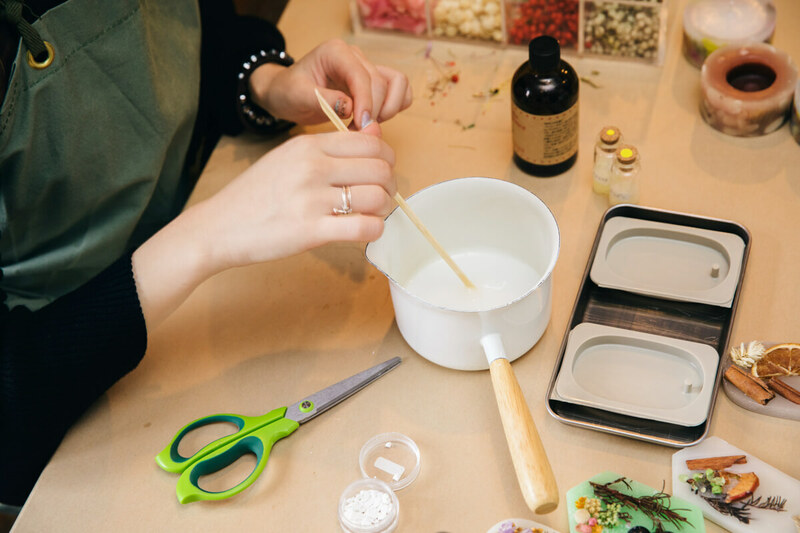 Candle Studio is an all-out candle-making school, offering everything from one-off lessons for beginners to a JCA-recognised candle craft course, candle artist course and instructor course. The location is visited by newcomers and pros alike. The one-time lesson Suu took cost ¥4,000. 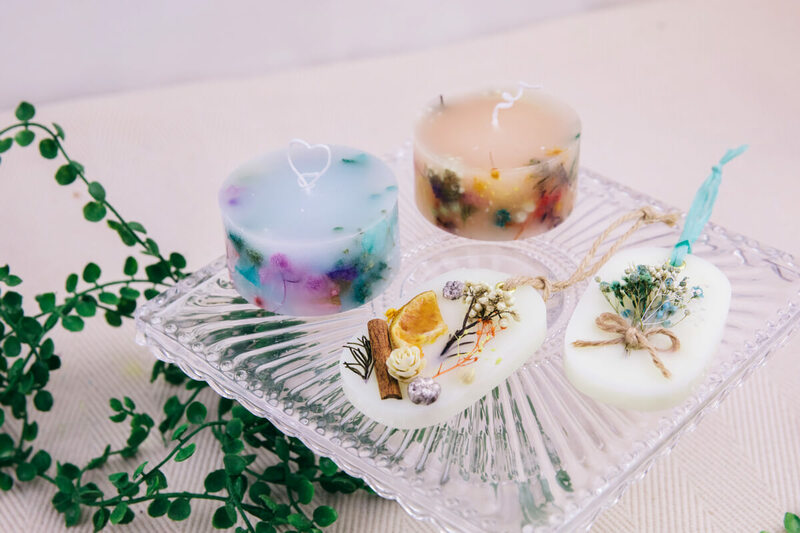 With that, you get to pick from a botanical candle and aroma wax sachet. You can either make 2 of the same type or 1 each. 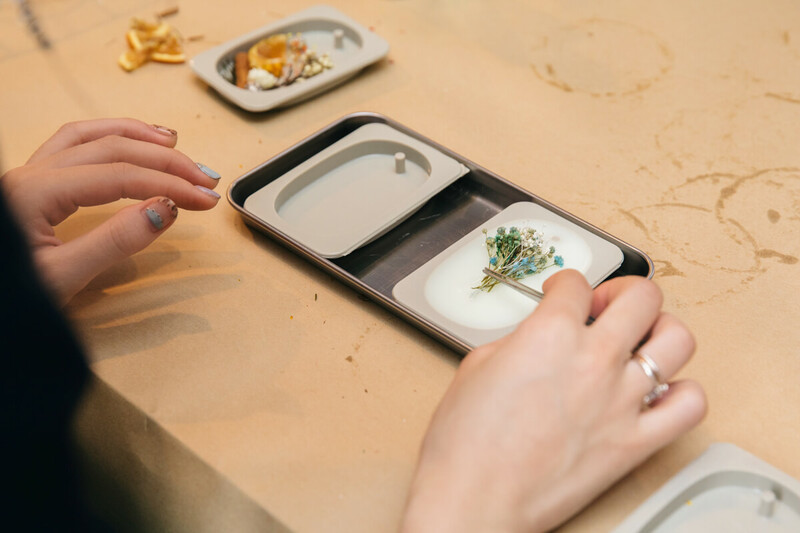 You get to pick different coloured and fragranced dried flowers to make your own personal candle. Suu was given special permission to make 2 of each. After putting on her apron it was time to get creating. “I’m nervous whether I’ll do it well or not but I’ll try my best!” said Suu. 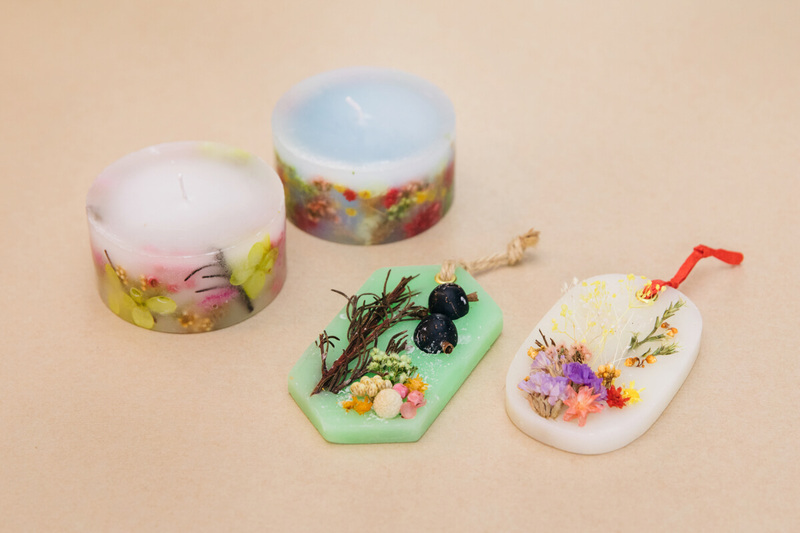 First up, the botanical candles. You start by picking the candle’s base colour. Suu went for blue and orange candles. 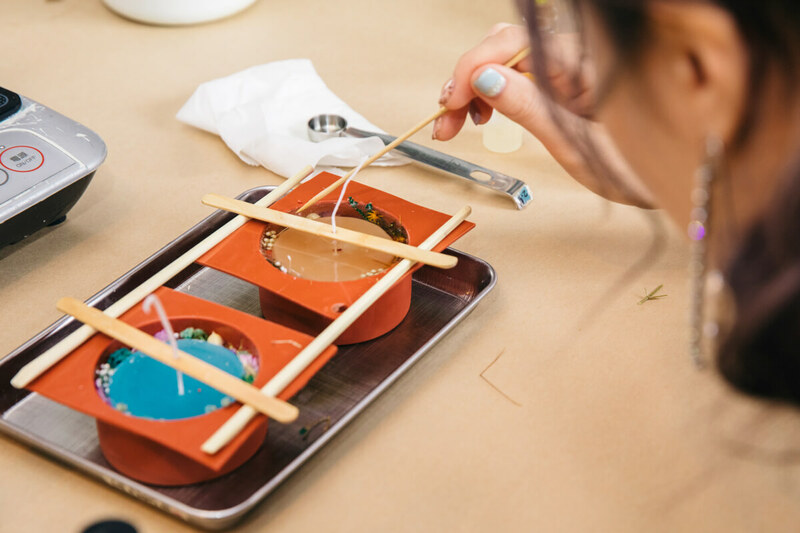 After putting the candles in the silicone mould, you pick the flowers you want and fit them into the gap around the candle. 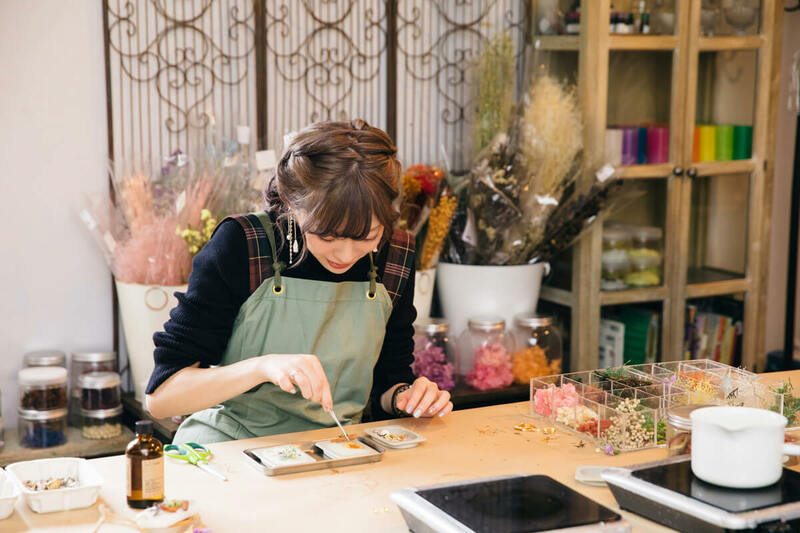 They have a whole range of decorations prepared including dried flowers, preserved flowers, paper berries and so on. Choosing what to go in there is all part of the fun! Use pin sets while cutting the flowers of your choice with scissors and place them in. Arrange them around the outside of the flower with the sides you want to show. If you use thin flowers they will look transparent when you light the candle, so keep this in mind when choosing your flowers. The secret to success however is to not think about it too much and just go all in. 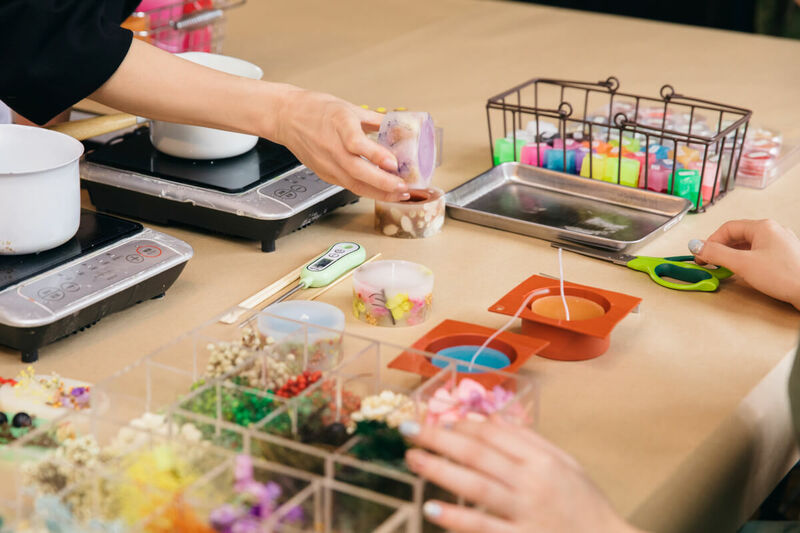 Once you’ve placed all the flowers you want, pick a scent of your choice from the samples provided. Suu went with cranberry and rose. 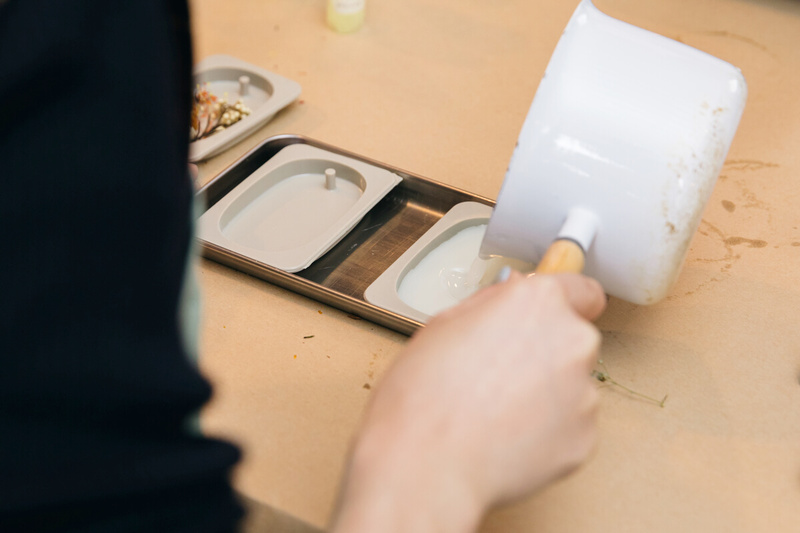 Melt the wax to 65℃-70℃ and add one spoon of your chosen fragrance. Heat the scented wax once more and pour into the silicon mould. After releasing the air from the center of the candle, arrange any flowers that have floated to the top and set aside to harden. Next on the list is to make the sachets. Like before, pick out a base colour from the colour samples provided. Suu chose a white base this time. Transparent wax is mixed in with the white colourant. To make the colour a little creamier mix in just a tiny bit of vanilla colourant before adding the fragrance. Suu picked plumeria and mango. Next is to position the dried flowers. 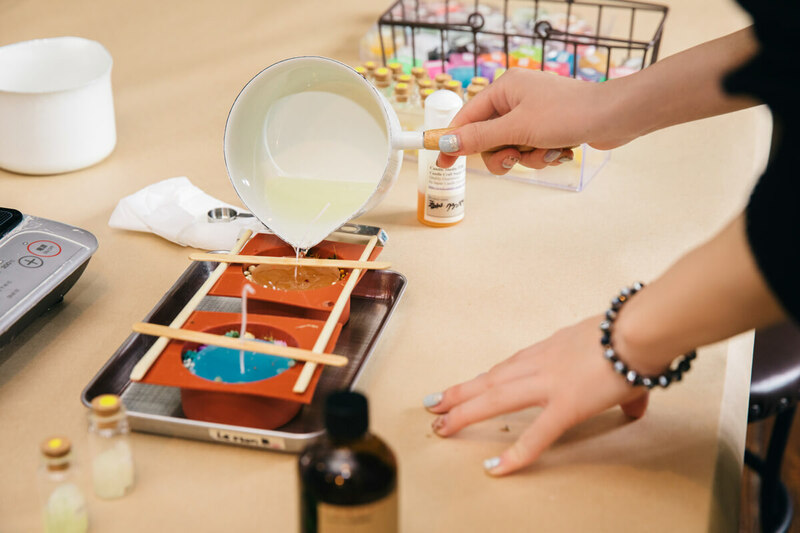 With the sachets, you will add dried flowers on top after pouring the wax into the mould. So think about how you want them arranged first by positioning them in the mould first. Once you know what you want, add the wax into the mould. Once the wax has cooled slightly and skin has formed on the surface, arrange your dried flowers. Suu styled hers like a bouquet. She then added dried flowers and fruits to the other one. Now all that’s left is to wait! While Suu was making the sachet, the first candle she started on had hardened. She removes it by pushing it up out of the silicone mould. After curling the wick into a beautiful shape it’s complete! The sachet was ready now too so Suu removed it from the mould. Suu adds an eyelet and chooses a ribbon of her choice to complete the sachet. Her botanical candles and aroma wax sachets are complete! “It was a little hard as it was my first time, but I was able to fully concentrate. It was so much fun! The time that went by making them was very therapeutic. 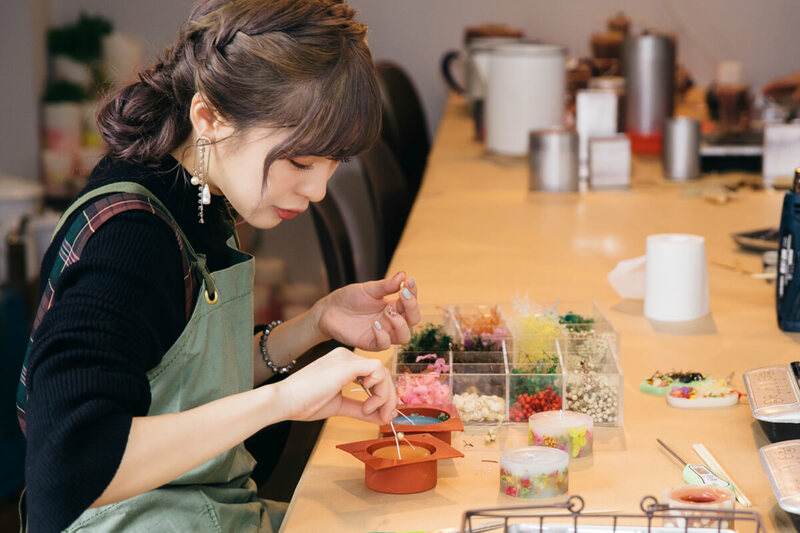 You can make all sorts of other candles too, so I want to come back ASAP!” explained Suu as she booked her next class right there and then. The class was a big success and Suu left super satisfied. 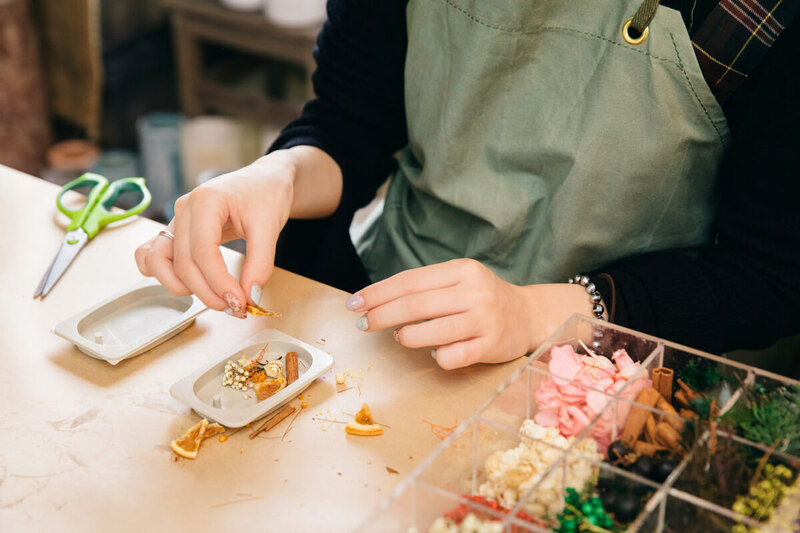 Candle Studio Daikanyama are now holding classes to make snow dome and Ornament sachets for the Christmas season. 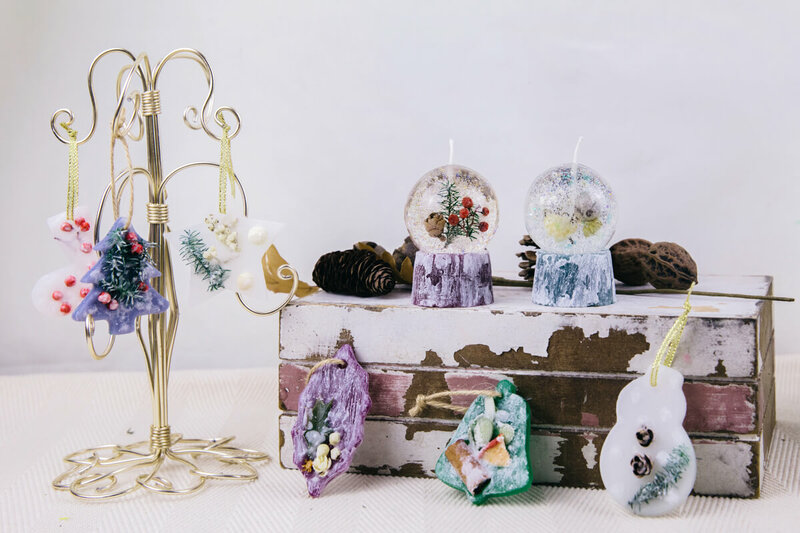 It costs ¥5,000 to make one snow dome candle and three sachets with Christmas designs. They cater to all beginners too, so if you’re interested you can feel at ease if you visit. Try it yourself.